ADB and Fastboot drivers are one of the most important thing for the Android users, with the help of these drivers you can easily flash a kernel or system image on android devices. 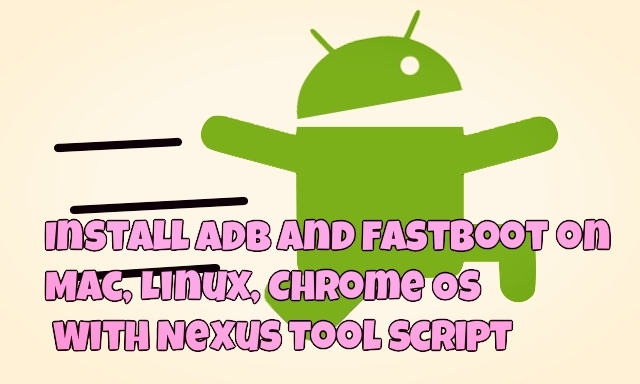 In our previous method we mentioned about so many way to setup the ADB and Fastboot drivers such as How to Install Nexus 5 Driver (ADB & Fastboot) and How to Install Android ADB & Fastboot Drivers On Windows. Today in this guide we;’ll show you how can easily setup ADB and fastboot driver on your Mac, Linux, Chrome OS with the help of one single command. The process is very simple and one of the easiest method to instal the drivers, all you have to run a command on your machine to install and install the drivers. All credit goes to the XDA member corbin052198 for posting this script command. These commands will download the selected script and run it. The script will download the files it needs during runtime, so it requires an internet connection. Lets take a look how the command works and how to setup the drivers. Running this command will setup the ADB and fastboot drivers on your machine. Currently the Nexus Tools commands work perfectly on the Mac and Linux systems, the support for ChromeOS is experimental at the moment. Once the drivers are setup on your machine you will easily flash the system image or flash kernel on your android. In future if you want to uninstall the drivers from your machine, run the following command and this completely uninstall the drivers from your machine. If you are the MAC, Linux or Chrome OS users then you have to must try this command to install the drivers. Once of the fastest and easiest way to install and setup the ADB and fastboot.